After six straight days of eating at Anna's MIT for breakfast, I was denied this morning by El Presidente himself. Sort of. 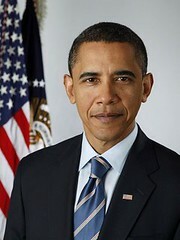 Barak Obama is in town to deliver a speech on American leadership in clean energy at MIT. Cops and barricades lined the sidewalks and blocked the streets. 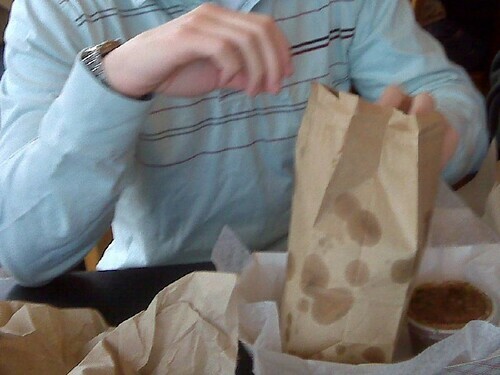 You'd think the kid with the burrito website would be able to convince Mark to order more than chips and salsa at his first trip to Anna's Taqueria. Nope. Chips and salsa only. I don't like to shovel. I don't like the snow either. Put the two of them together and what you get is my car looking like an igloo. Seth (pictured) and David were nice enough to pick me up and take me to Anna's MIT. My car got to stay cozy inside its igloo. 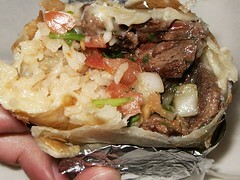 I got warmed up by a super steak burrito with extra hot sauce. No more dining out for breakfast. Fire up the rice cooker. I assure you that everything is just fine. Proof of my well being is the photo below. 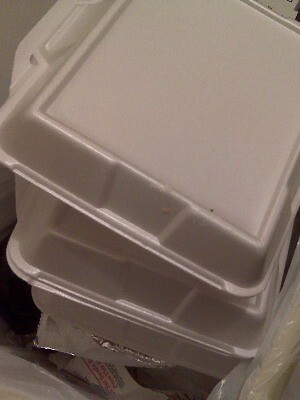 Here's what my trashcan looks like after eating a Mexican Plate from Anna's MIT for seven straight breakfasts. Hmm. Maybe there is something wrong with me. After Halloween, everybody is all about sharing pictures. Burrito Blog is no different. 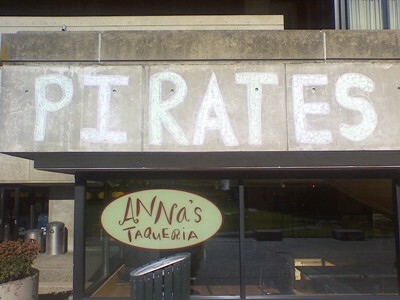 On my way to grab an early morning chile verde plate from Anna's MIT, I noticed evidence of typically conspicuous ninjas and their less covert arch rivals, pirates. 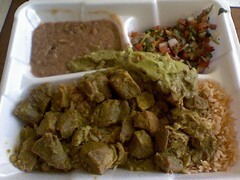 The chile verde plate with refried beans and guacamole was particularly excellent on this occasion. No too hot, not too mild. Just right. Maybe I should have been Goldilocks this year. This Anna's Taqueria meal was rated: 8.3. Anthony's standard fare is a super burrito and mini quesadilla, pictured. Phil was in town for a night so we all met up at Anna's Taqueria on Beacon Street like it was the summer of 2000. 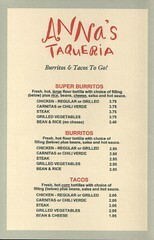 Back then, Phil's standard fare was two super burritos. Three on occasion. Anna's MIT opens at 7am. I like a big breakfast and a nice walk on a sunny day. Sometimes though, the early bird gets pooped on by another bird, the kind with wings an no concern for humans below. Then the early bird has to go back home to shower. I heard it's good luck to get bombed with bird dung. I disagree. I think it's just something people say to make themselves feel better about getting pooped on. Good thing Anna's is open for lunch. There's not much to be said about this photo from Anna's MIT. That is El Goldo, dining adventurer. Lengua quesadilla in hand. I'm way late to the dance on this one, but I assure you it's not a distance between me and witnessing burrito news. It's the distance between me and reporting burrito news. It's a time and motivation problem, related to an influx of work and sunshine. 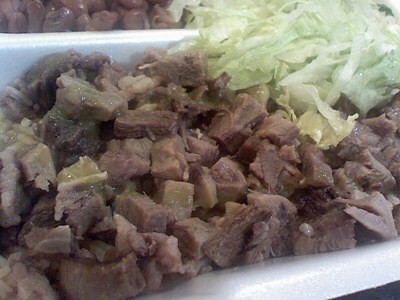 The first time I ever had lengua, which is boiled beef tongue, was at Tacos Lupita, near the very beginning of Burrito Blog. At the time, the textural authenticity was a bit much to take. I grew into it a couple meals later. 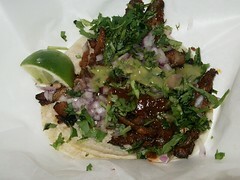 Anna's lengua is cut small, as seen in the photo above. It's gringo friendly. Give it a try. Dave Stuart, Junior Analyst, is as quick on the wit as he is on the chow. 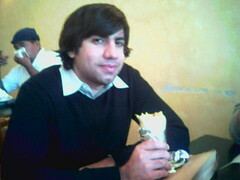 He could barely control the rapidity of his burrito to mouth reflexes to pose for a picture at Anna's Taqueria. It had been a while. Unfortunately, the speed at which Burrito Blog posts stories is inversely related to my level of other responsibilities. 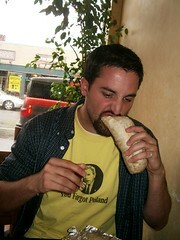 It's easy to forget that Burrito Blog is merely a hobby. The best hobby ever, perhaps, but a hobby none the less. Dave, I'm sorry this took me a month to post. After much anticipation and long delays, Anna's Taqueria finally opened the doors to their location on Cambridge Street across the street from Massachusetts General Hospital (Map). Anna's first location in Boston proper will open at 7am on weekdays and 8am on the weekend. Why so early? To serve breakfast burritos. See also: The Best Looking Salsa (part 1). The elusive breakfast burrito, formerly available only at Anna's MIT, is now on the menu at Davis. New hours accompany the change. Doors open at 8am. Thanks to John Liu for the tip. That concludes my Mellencamp rip off. Not a fan of that tune anyway. At all. The three of us were at Anna's MIT on a sunny day. Brave patrons can still find an empty seat outside, just bring your mittens. Recall what dreams are made of. Essential ingredients are Mexican food and the summer sun. 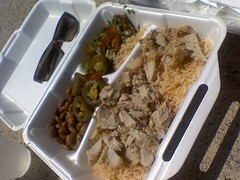 Pictured here is a carnitas plate with jalapeños and extra rice from Anna's MIT. I'm really going to miss summer. Good thing I'm headed back to California soon. This Anna's Taqueria meal was rated: 7.7. Burrito Blog has some catching up to do. Mr. Fink and Miss Perry did visit me Atlantic Northeast many weeks back. Speculation that the delay is caused by lukewarm feelings of friendship towards these two is without merit. I've been busy. Recall that Mr. Fink was responsible for introducing me to the Big Enchilada in Manhattan. Now it was my turn to host. We went to Anna's at MIT for their Massachusetts Mexican food initiation. Will they return? Let's hope so! His breakfast burrito weighed in at 12.3 ounces, Miss Perry's at 12.5 ounces. 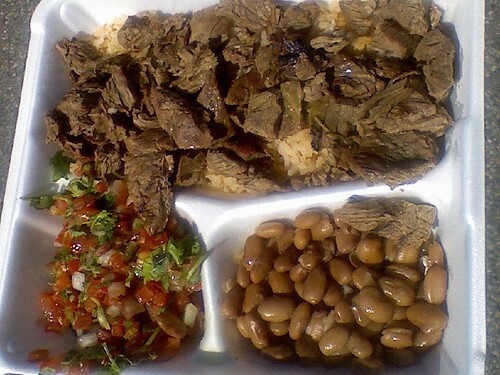 Anna's Taqueria raised prices again. Shed a tear. Lincoln no longer has you covered; a super burrito with guacamole costs $5.25. 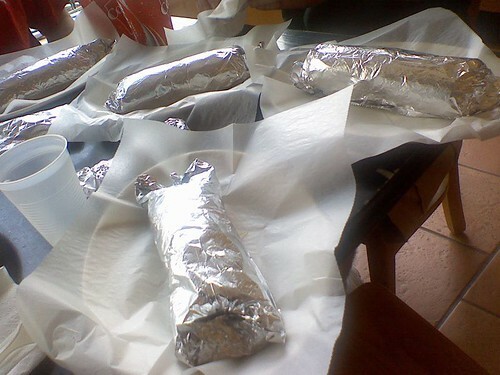 Hikes or no hikes, I can't think of a better way to spend you lunch money than burrito procurement. Let this be a model for all other salsas. 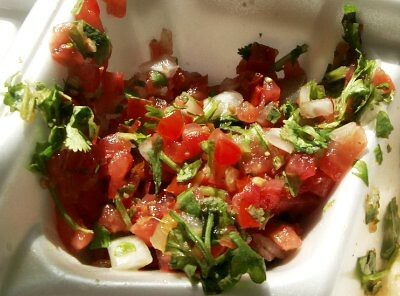 The tomatoes are so fresh and red, the diced onions so perfectly sized, and the cilantro plentiful but not overbearing. Does that count as three servings of veggies? To all the cilantro haters out there, start your own blog. I'll hear all complaints about Burrito Blog but don't mess with my cilantro. The steak plate featured was from Anna's MIT location in the early morning. Breakfast, baby, breakfast. Hello! Sorry it took so long to get back on the horse after that little hiatus. It won't happen again. I present to you an Anna's creation to be had only at the MIT location. 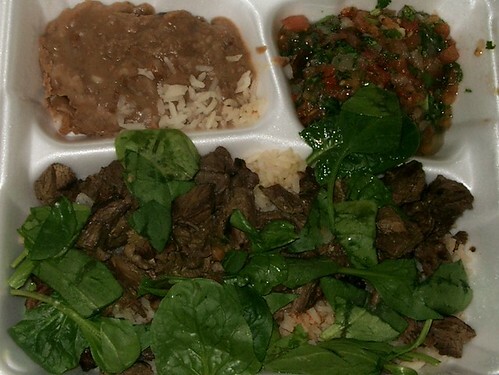 Steak plate with espinacas instead of lechuga (spinach not lettuce). Best plate ever? Just might be. Last summer there was a blight on spinach; this treat was an impossibility. I'm hooked on spinach. Lettuce is for farm animals. See also: the elusive breakfast burrito and the more elusive breakfast taco for other MIT only specialties. This Anna's Taqueria meal was rated: 8.5. This super steak burrito with refried beans and no cheese did not make it out of the car to meet up with the scale for weigh in. See also: Hands at 10 and 2. This Anna's Taqueria meal was rated: 8.6. Like the legendary piece of straw that buckled the camel's spine, so too is this chile verde plate. For weeks, Anna's MIT location was feeding (ha!) my addiction for a breakfast that'll wake you up in the morning. I know, I know. This doesn't look like breakfast food. And the MIT location has breakfast burritos. I am responsible for my own fate. Sometimes you learn when to say enough is enough. This experience taught me the hard way. No less delicious, this chile verde was considerably more spicy than usual. My stomach was considerably less cooperative. I gotta say it wasn't the chile verde's fault. 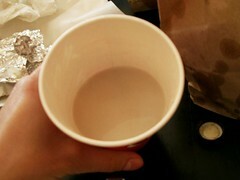 It was the quart of milk I drank with the meal. Soothing qualities of guacamole and refried beans proved inadequate in quelling the mouth fire. Perhaps men with high burn tolerances like Nick or Shane would have fared better. Plus I'm a lactard. Turbz and I met up for lunch at Anna's Taqueria on Harvard Street in Brookline a couple weeks ago. We talked about the beaches and the summer. Since high school and as roommates in Roslindale, we've made countless beach trips. I'm looking forward to getting back to that. Summer here we come! 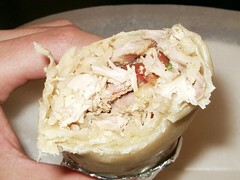 A fan of the beans and rice burrito, Turbz switched it up and went with the super chicken burrito. I had two tacos al pastor and a carnitas taco. Note that the tortillas on the al pastor tacos (left) are slightly smaller than those of the carnitas (right), in line with their pricing: $1.35 and $2.05. This Anna's Taqueria meal was rated: 6.7. 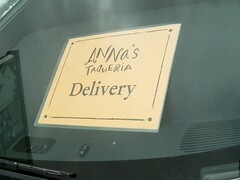 This sign was spotted on the dashboard of a car outside of Anna's on Harvard street. Think what you like. Personally I doubt it. 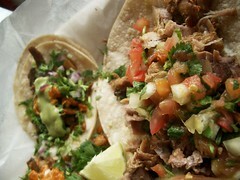 Many have heard rumblings of a new Anna's Taqueria location opening at Mass General Hospital (MGH). Well, I haven't seen it with my own eyes, but I think this rumor can be confirmed. Fans of Anna's residing in Beacon Hill, prepare to rejoice. After a many weeks with little break from the cold and keyboard it was time for a revival. Vacation revival! Cora and I made our way up to the slopes for a few, well, trips back down the slopes by way of snowboard. This, all on the heels of a super chicken burrito from Anna's in Porter Square. Recall that burritos also pair well with skateboards. And sunbathing. Is there ever a bad time for a burrito? This Anna's Taqueria meal was rated: 7.1. 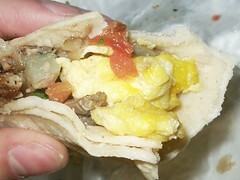 Related to the elusive breakfast burrito, the more elusive breakfast taco is smaller, smaller even than the regular taco. In fact, I've never only on their al pastor taco seen such a small tortilla. Note: physical size is unrelated to size of flavor, amigo. The breakfast taco comes with all the same ingredients as the breakfast burrito: huevos, potatoes, salsa, and Mexican sausage. It is available only at the Anna's MIT location. There's no better way (for me) to usher in the Chinese Year of the Boar than with a bite of a beast that shares the name. This picture deserves to get blown up. The carnitas shown tasted amazing and visibly so. It's pretty hit or miss, so I try and make a last minute decision when ordering. Let this be the standard. 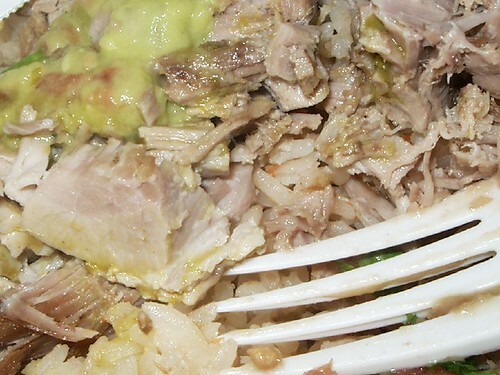 When the carnitas looks like this, get it. This Anna's Taqueria meal was rated: 8.9. It's about 1am and I'm on the couch watching Snakes on a Plane with one eye and uploading photos of my food to Flickr. I come across this amazing looking steak quesadilla from Anna's Taqueria. Wow, I'd like one of these about now. Felipe's is open and offers similar excellence. Unfortunately I happen to live in Massachusetts at this February moment, and it's too cold to go outside. Ironic that I reach into the freezer for something to eat. This Anna's Taqueria meal was rated: 7.3. 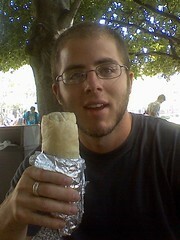 My friend Nate loves burritos. You should feature him on your site. 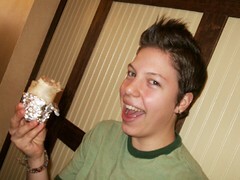 My friend Me loves burritos. 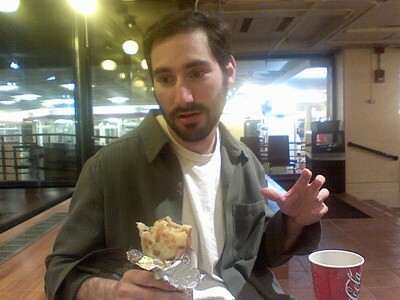 You should feature a picture of him eating a burrito on your site. I have no choice but to share Nate's face with the world. 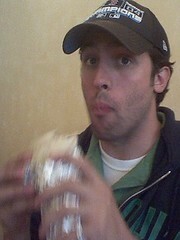 He is seen eating his very first super burrito from Anna's Taqueria. 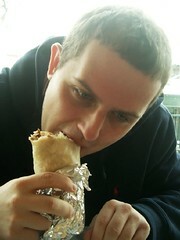 Currently residing in Los Angeles, Nate was overwhelmed by the superiority of this Massachusetts burrito. He was unimpressed by the local sunshine. Michael Prerau of the The Food Monkey insisted he show me the ultimate menu item at Anna's Taqueria. 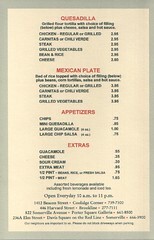 Please remember that there are over 12,000 ways to order at Anna's, based on their menu options as of May 2005. This is the story of one man's favorite. Mike discusses the dilemma of such a rare configuration in a recent post. Check out the link above. Kevin enjoys Anna's Taqueria one last time before moving to Los Angeles. Despite its wealth of tamales and tacos, Los Angeles suffers from a serious lack of steamed tortillas commonly found in San Francisco and Boston burritos. Boston lacks the wealth of sunshine commonly found in San Francisco and Los Angeles, dammit. See also: The Last Supper. Location: Somerville, MA. 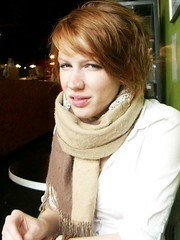 Setting: Breakfast time at the coffee shop with Cora. Dialogue is loosely quoted. Me: Yeah, I'm not that into coffee, I'm just going to run down the street and grab something else. Be right back. What, you frown at quesadillas at 10 am? Or did you want one? What's with the scowl? This Anna's Taqueria meal was rated: 6.3. That's right Anna's loyalists, the tale of the breakfast burrito is not, in fact, a myth. I have seen it first hand; I have tasted its legend. 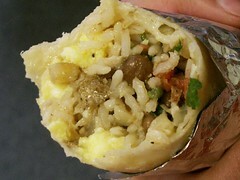 The breakfast burrito is available only at the MIT location. That Anna's Taqueria installation opens at 7am (I do not wake up that early) and thankfully continues to serve the breakfast burrito until mid morning. The breakfast burrito does not satisfy my quest for early morning huevos rancheros in the Boston area, but it's the best substitute found so far. This Anna's Taqueria meal was rated: 7.9. This, an email from Mr. David Reynolds regarding recent price hikes, recalls the days when people knew what two quarters and two pennies were good for: exact change on a super burrito with guacamole at Anna's Taqueria. Seriously, who would have thought this CPI would hit so close to home- or quite literally, my stomach? I remember the good old days when my super Carnitas, beans and rice, salsa, hot sauce and guacamole only cost $4.52. I used to keep 52 cents in my car at all times, just in case I had an unexpected Anna's attack. These days I can hardly keep pace with inflation. If this keeps up, I might have to even start forgoing the guacamole. Dave, I miss it too. We all do. But my demand for guacamole is inelastic. After some trans national trash talking between Phil and DJ Turbz regarding the rapidity of burrito consumption capabilities, the two finally met for a showdown at Anna's. 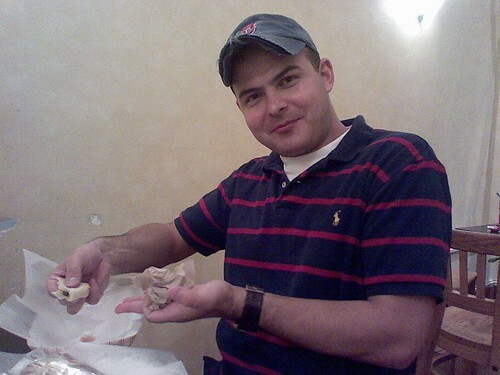 Sheb Shumar, with a reputation for brief meals, requested inclusion in the competition. Enter John Liu, last minute entrant, ringer, and soon to be Junior Burrito Analyst. Enough hype. To the tape! From left to right: Phil Jonas, DJ Turbz, Sheb Shumar, John Liu. Stick around for the closing seconds of commentary from the contestants where John Liu delivers a proverbial chest thumping assertion of dominance. Super burritos were nearly agreed upon, with all participants ordering at least cheese, rice, beans, salsa, with a choice of steak or chicken. John and Phil decided to get guacamole and sour cream postulating that a favorite burrito can be eaten faster than the bare minimum. 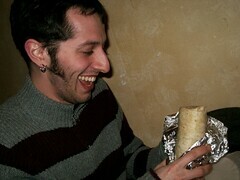 At the weigh in, Phil's burrito tipped the scale by a moderate but non critical margin. 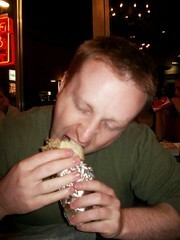 Burrito Blog will hold another speed eating contest, this time open to the public. Though the date is to be determined, renowned Medford dentist Dr. Steve Lentine has already registered. 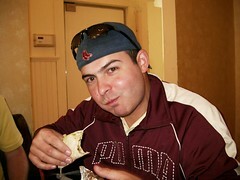 Update: Seth Shuman has allegedly shown the video to the delight of Johnny Damon, expatriated Anna's Taqueria junkie. Yes friends, Anna's Taqueria has again raised their prices. After the July '05's story on Tacos and the Consumer Price Index, they have once again raised the bar. Expect some 'creative pricing' as employees adjust to the new burrito rates. 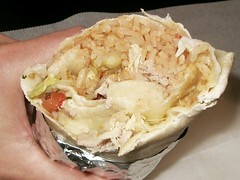 Today's super burrito cost $5.37 after tax. If anyone knows of a study on the price elasticity of fast food (preferably Mexican), please send it my way. Some have been asking what I'm up to, running from coast to coast. Does Burrito Blog fund my lavish lifestyle of leisure? No. John and I have been spreading the work of Grace Potter and the Nocturnals. Just push play below, be patient, and be prepared to be amazed. Listen to the whole thing. If you read this far without pushing play, now is your chance to correct your mistakes. Go back and do it. On this quest, we have had help from Internet marketing superheroes Grace Rochford and Jenna Simon. To show our extreme gratitude, John and I felt it only appropriate to shower them with beans and rice. We all met up at Anna's Taqueria in Porter Square to celebrate their hard work. These two will no doubt go far. Loyal readers may remember that John and I rock at human resources. Grace and Jenna are no exception. This has got to be one of my favorite items at Anna's: chile verde Mexican plate, with refried beans. 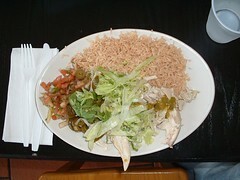 This meal was taken while out to lunch with Jerry and Zags a couple months ago. In an effort to avoid eating burritos in secret, I'm catching up on may unshared burrito experiences from days long past. This (see picture) is what happens when a man who grew up on the addictive taste of Anna's Taqueria goes without for two years. 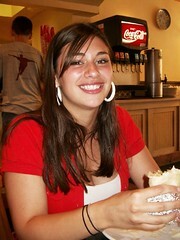 Even though those two years were spent in California, some burritos (quesadillas in this case) cannot be duplicated. Direct from Logan Airport, Jerry required minimal persuasion to make a stop before seeing his family. Jonah: Jerry, you wanna go get something to eat? Jerry: I don't know man, my mom's making Sunday dinner. Jonah: Zags and I were planning on going to Anna's. Jerry: Taqueria?! Let's go! Don't tell mom. 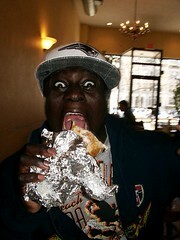 The quesadilla was no match for Jerry. Flashback to when John and I first met Nikhiel. We knew early on that this kid rocked, then we found out he likes burritos, too. Before moving to The Philippines, we had one last lunch at Anna's. As expected, he got the Al Pastor. And as expected, it was delicious. Do they have tortillas in The Philippines? Poor kid. 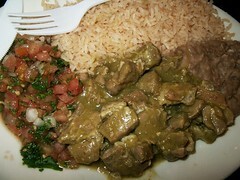 Though not as beautiful as the greens on National Geographic, those of the chile verde Mexican plate are more delicious. There's some bad blood between Anna's and Boca Grande. I'm going to have to call you and your website a big liar...If you'd like to admit that you brought this bone yourself, just to hold up for your picture, I would certainly appreciate it. If you can present me some proof of the bone, I would also listen. Well buddy, other than the photograph, I'm afraid I'm out of proof. 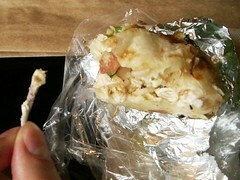 In fairness, I found a bone in my boiled chicken quesadilla at Anna's, pictured above. In chicken that is boiled, small bones sometimes escape detection. I do not carry them in my pockets. Look, A Brand New Burrito! The joy on Nick's face is unmistakable. And why not? He just unwrapped a burrito from Anna's. Are you going to make that gift giving season a reality and buy me lunch? Sunday, December 25, 2005 by Jonah. Permalink for Look, A Brand New Burrito! I got an email mid August from a guy named John. He pointed out that there was no mention of a quesadilla from Anna's on Burrito Blog. Well readers, I've had the Anna's quesadilla many times and here's proof. They make their quesadillas using a lightly fried 10" tortilla which is then filled like a burrito (rice and beans are not standard). These quesadillas are excellent, although they are a little too oily to eat every day. Anna's quesadillas are double fold, while others are single fold. Which do I prefer? I like variety. 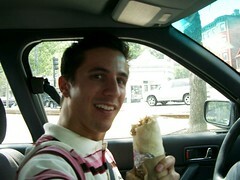 I used to be unreal at eating while driving. And by unreal I mean I wouldn't spill a single grain of rice from my super burrito. Of course, you should always concentrate while behind the wheel - I encourage safe driving. 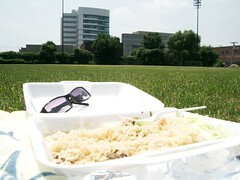 You just can't beat laying in an empty field on a sunny day, working on your tan, all alone with a Mexican plate. If only all meals could all be this peaceful. This Anna's Taqueria meal was rated: 8.8. While lunch at Anna's Taqueria may not be included in the market basket of goods used in calculating the consumer price index, it is in my personal edition of the CPI. July marks a flat $.10 increase in all items at Anna's. Crack open your piggy banks, you now have a good use for your dimes. 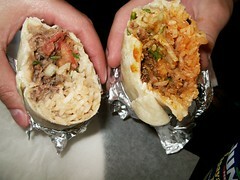 Check out the difference in color between the carnitas super burrito (left) and the al pastor super burrito (right). Remember that Count Chocula ad from when we were little - about how the Coco Crispies were so strong they would make the milk taste like chocolate? Well, I was never allowed sugar cereals, so instead of a sweet tooth I became addicted to starches. Yeah, starches, like rice and tortillas. This Anna's Taqueria meal was rated: 6.6. It is rare that Anna's adds items to its menu, with the notable exception of the Al Pastor. Horchata is another such exception. It's a cold, rice drink with cinnamon and almond flavors. Allegedly, it is dairy free. Although it does not photograph well, it tastes good. Every time Junior Burrito Analyst Anthony comes back into town he's got a list of things to do and people to see. This time, he stopped by his parents' 25th wedding anniversary on his way to Anna's Taqueria. Instead of one, he picked up two mini quesadillas and a super burrito. As I reported earlier, the lines are shorter at the Harvard Street Anna's than the Beacon Street location. Yeah, unless of course there's a field trip in progress. For years, there wasn't a single menu change at Anna's Taqueria. 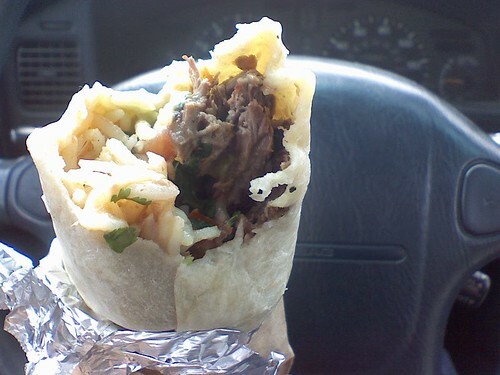 Don't call it the Brookline burrito dark ages - Anna's is a finely oiled machine. A few months ago, al pastor was added to the menu. They're pushing the taco, pictured, but you can order a burrito or quesadilla al pastor. It's probably the greasiest thing on the menu, but works great as an snack to precede a burrito. Today, Sara said to me, "You know I can't believe you've stuck with Burrito Blog this long." Clearly, the average person does not ponder a lifetime of burrito eating options. At Anna's Taqueria, an establishment with very few menu selections, we, the Burrito Analyst Team, have calculated 12,288 standard item combinations for the Super Burrito alone. This does not include combination or double meat burritos. That would take about 34 years, eating one burrito per day. Sara, Burrito Blog will never die. This past weekend Junior Burrito Analyst Dave Stuart was back in Boston (well, Somerville really) for a little reunion with his college buddies. We met up at Anna's in Davis Square for a little snack. Check out his shirt - a reference to the 2004 presidential debates. Oh, and don't ever drive from Roslindale to Somerville. Ever. I passed within a 1/2 mile of these burrito places on the way (in order): Yucatan Taco, Anna's Taqueria, Boca Grande, El Burrito, Felipe's, Boca Grande (again), Anna's Taqueria (again), Tacos Lupita, Qdoba, and Picante. 11:35 AM: I arrive at Taqueria. 11:36 AM: I order a super boiled chicken burrito with no beans, no cheese, and extra hot sauce. 11:38 AM: I sit down to eat. 11:40 AM: The Paparazzi arrives, intimidates me with a large lens. 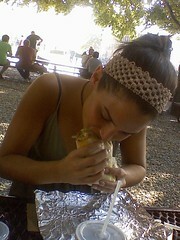 11:42 AM - 11:55 AM: I hurriedly eat my burrito, avoiding swarming, screaming fans. It's all because of my fame. Curse this celebrity business. This Anna's Taqueria meal was rated: 3.1. Unquestionably, this was the best birthday in recent memory of all time. I'd go into detail about my day, but I know you're not that interested in anything other than meals, so I'll get to the point. 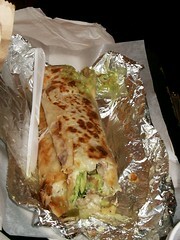 This is a super steak burrito from Anna's Taqueria with extra hot sauce and guacamole. It was a little on the large side and completely delicious. 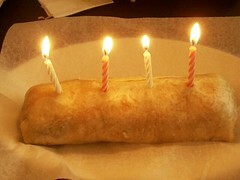 As all the loyal readers know, Cinco De Mayo was my birthday. 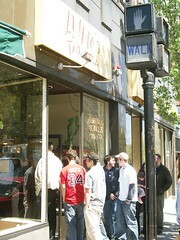 Somehow, my lunch plans were leaked, and people lined up out the door at the Beacon Street Anna's awaiting my arrival. The truth is, Harvard Street always has shorter lines than Beacon. They also have more seating. Harvard Street was closed for expansion all last summer, and I think there must be some people out there that permanently switched to Beacon. News flash: Harvard Street Anna's is open and the lines are shorter. 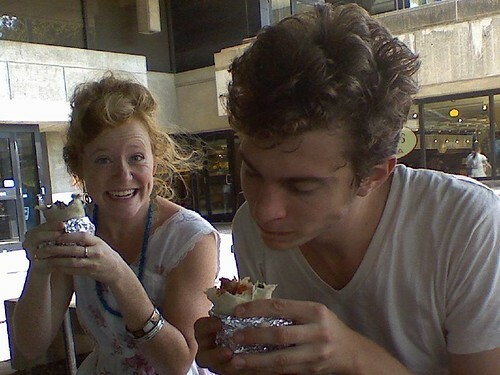 After a long period of running around town, John and I returned to Anna's Taqueria. It really has been a long time. The last time I was here I didn't bring my camera, and am still waiting for John's friend Alana to send me the photos from her digital. Unfortunately (or fortunately), there was some free pie at work today which I pigged out on at 10 am, so I wasn't that hungry. As a result of the pie tasting, I decided to get the regular chicken burrito. Still, it was great to be back at Anna's. This Anna's Taqueria meal was rated: 7.2. I was really in a terrible mood yesterday. 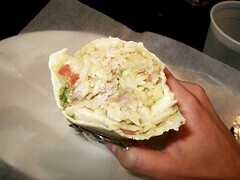 I went to Anna's (Beacon Street) on the way home from Harvard Square to cheer myself up with a super steak burrito. Ordinarily I stay away from the guacamole. Based on the sheer volume of burritos I consume, I've got to keep each one as healthy as possible. But this was a craving, so I splurged. 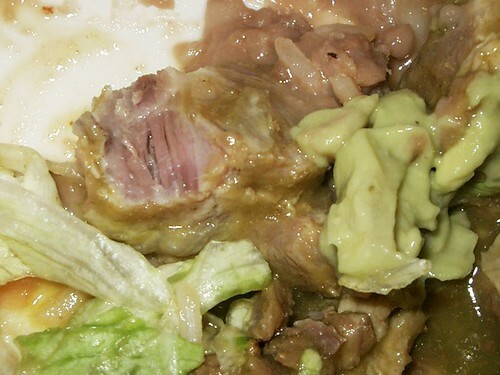 Please note, I was feeling a little woosy before eating the burrito. Historically I've found that a burrito can cure just about any stomach or emotional discomfort. Two birds with one stone? No. The stomach ache is with me 24 hours later. Anna's, I do not hold you responsible. It's not you it's me. This Anna's Taqueria meal was rated: 5.1. Read that again. This is a true story. 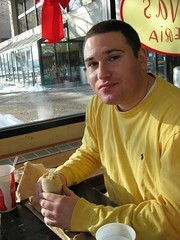 Phil Jonas (pictured at right) ate three super burritos in one sitting. It was this past winter, and it was unforgettable. Phil orders his burritos 'con todo' which means they're huge. Witnesses to this rare event were Rich, Ethan, Tilden and me. We demanded he try. 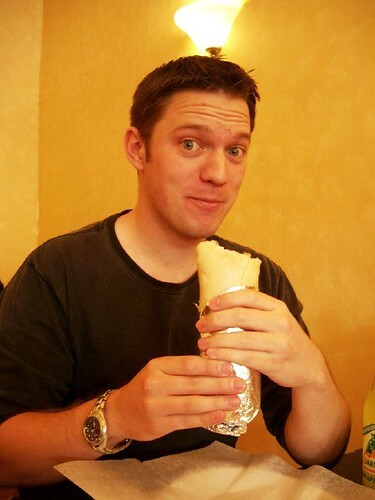 Phil hardly flinched until the final bites of the third burrito went down. Following this gross overindulgence Phil insisted we walk around for 15 minutes or take him to the hospital. This Anna's Taqueria meal was rated: Ridiculous. It's been about two weeks since I had lunch at the JFK Anna's. What's gotten into me? This was a boiled chicken plate with no beans. Please pass the extra hot sauce. Thank you. PS: The woman at the counter seemed perplexed as she watched me photograph my food. I have no shame. Stopped by Beacon tonight with Greg to get a regular steak burrito with a double agua on the side to help kick the hangover from Nick's bash the night before. That water sure was delicious. Then we drove to Providence to get our faces melted by Minus The Bear. 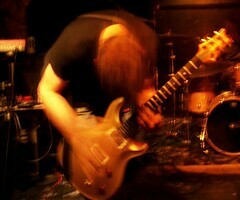 That picture's not from tonight - Middle East Upstairs about a year and a half ago. This Anna's Taqueria meal was rated: 4.2. 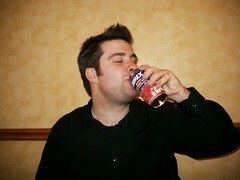 Greg catches a gust of bliss as he sips from his Jumex. He also had a steak burrito at Porter. He likes the black frijoles. To each his own. Just wrapped up a steak plate from the Harvard Street location. The corn tortillas were a little sticky. I'm not sure why. Observation: they changed suppliers for plastic utensils. How do I know? Because I smoke burrito crack. This Anna's Taqueria meal was rated: 4.5. 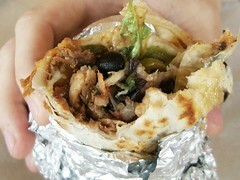 This was the first burrito I photographed to share with the world. It's from the Porter Square location. Greg and I tried to go to Tacos Lupita but they were closed for Good Friday. After facing some locked doors, we spun around and cut through a parking lot to get to Anna's Taqueria. Now ordinarily I don't get the carnitas, but it was looking extra lean so I went for it. It was superb. No beans this time, extra hot sauce and guacamole. This Anna's Taqueria meal was rated: 9.0. Anna's and I go way back. As a student at Brookline High, I fell in love early. 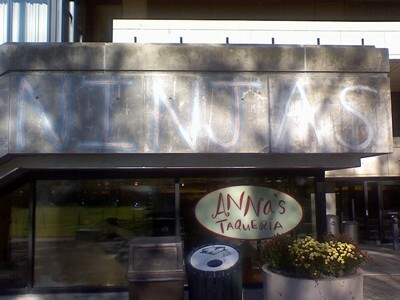 Some people call it Anna's (pronounced ah-na's, not an-a's) but my friends mostly call it Taqueria. It's always been a hometown favorite. 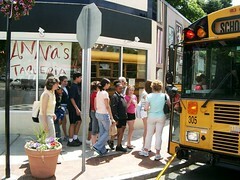 Anna's is open from 10 am to 11 pm each day. Update! There are 6 locations: Anna's opened in MIT's Student Center (source) and at MGH. Anna's also finally got a website together. You can check out a PDF of the current menu and prices here. While the menu is simple: Tacos, Burritos, Super Burritos, Quesadillas and Mexican Plates, once you find something you like, you'll be able to eat it every day.